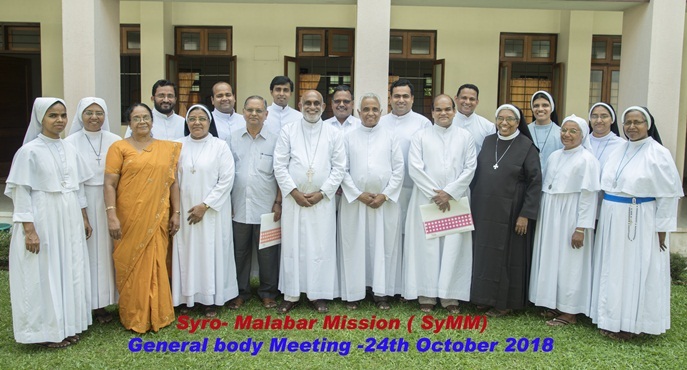 The XIX Synod, while planning for the celebration of the Syro-Malabar Mission Year (2011-2012), stated: “Start an organization (Funding Agency) to help the needs of the Mission (E.16)”. As per the Synodal decision, an “ASSOCIATION OF SUPPORTERS OF THE SYRO-MALABAR MISSION (ASSM)” is formed on 01 October 2011. His Beatitude Mar George Card. Alencherry appointed Mar Gregory Karotemprel, Bishop Emeritus of Rajkot Eparchy, the Director of this Association. The purpose of ASSM as envisaged by the Synod of the Syro Malabar Church is to bring all the families of the Syro-Malabar Church into constant contact and communion with the Mother Church. The primary goal of the ASSM is to create missionary awareness in the hearts of the Syro-Malabar Faithful. The distinctive feature of the ASSM is that all the 9,00,000 families of the Syro Malabar Church are the members of this Association. Hence, ASSM is as extensive as our Syro-Malabar Church! 1. Dioceses/Parishes: All parishes of the Syro Malabar Dioceses collect a yearly contribution of Rs. 200/- from each family and send it to the ASSM office. 2. Religious Congregations: All Religious houses and the houses of the Consecrated life of the Apostolic Life are requested to contribute Rs. 500/- annually. 3. Individuals: Some well wisher individuals donate to the Mission work of the Syro Malabar Church. 4. Institutions: All the institutions of the Syro Malabar Church are requested to contribute Rs 1000/- annually. 1. "SPONSOR A SEMINARIAN” SCHEME A person or a family sponsors a Seminarian who joined for a Mission Diocese or Congregation, and pay Rs.1,00,000/- (One Lakh only) either in one time or in different instalments. The sponsor is given the name of the Seminarian after the first instalment. The Seminarians comprise from Philosophy to Theology. 2. “SPONSOR A SISTER” SCHEME This fund is collected to support the candidates in the Convents undergoing their formation to become a Religious Sister. In this Scheme a Sponsor donates Rs.50,000/- (Fifty Thousand) in one time or in instalments. 3. "MISSION SUNDAY COLLECTIONS" The New Director Bishop Mar Raphael Thattil re-vitalized ASSM in 2014 with the new idea of celebrating SYRO-MALABAR MISSION SUNDAY and the Synod in August 2014 agreed to celebrate it on 11 January 2015. But the Synod of Bishops in August 2015 decided to celebrate it as the SYRO-MALABAR MISSION WEEK or PRESHITHA VAARAM from January 06-12 in every year. To celebrate it we send prayer cards and envelops to all the families through parishes of all our Dioceses. We also send Wall Posters, Promotional Video, Handbook etc. to conscentize our people about Preshitha Vaaram. Prayer cards are printed in Malayalam, English, Hindi, Tamil, Telugu etc. 4. "PROJECTS" We help our Mission Dioceses and Mission Centres in India with projects for humanitarian activities, evangelization and pastoral care provisions. 5. "SPONSOR RELIGIOUS ARTICLES" Under this scheme our faithful are invited to sponsor religious articles like Cup and Paten for the Qurbana, Tabernacle, Religious Vestments (Kappa), Thaksa and Bible, Incense etc. Those who wish to donate any of these articles can entrust a certain amount in the Office. The Office will distribute these articles to the Mission Centres in need. We expect whole-hearted cooperation of all Faithful, Priests and Dioceses of the Syro-Malabar Church so that ASSM may one day become a well-known funding agency in India which helps the Mission Dioceses and Mission Centres in their genuine needs!